Incentive sensing polymers are polymers capable in response to little changes of parameters of a surrounding medium change their properties, they can reversible swell or contract in response to external conditions such as temperature, the solvent nature ionic strength, pH, an electric field and light. Thanks to these properties polymers can be used as systems with controlled selection of medicinal substances, sensors, carriers of insulin, artificial limbs. Water-soluble polymers thanks to activity of macromolecules in a varying degree are show sensitivity to influence of temperature. However, the greatest interest in the practical relation represents heat-sensitive polymers aqueous solutions of which have the lower critical temperature of disolution. Synthesize and investigate the physicochemical properties of new water-soluble thermo sensitive copolymers based on 2-hydroxyethyl acrylate and ethyl acrylate in a composition of 90: 10%; 80: 20%; 70:30; 60: 40%; 30: 70%; 20: 80%; 10: 90% by radical copolymerization, determine the composition of copolymers, calculate the copolymerization constants, establish the main regularities of the stimulus-sensitive behavior of copolymers with varying temperatures. In the paper, for the first time, obtained of novel thermo sensitive copolymers (CPL) based on 2-hydroxyethylacrylate (HEA) and ethylacrylate (EA). We found the compositions of copolymers and calculated the relative activities of comonomers the values of which evidence the higher reactivity of ethylacrylate compared with the reactivity of hydroxyethylacrylate. The study of phase diagrams of aqueous solutions of copolymers allowed identifying the presence of lower critical solution temperature (LCST). As the main physicochemical methods of investigation, in work are used: IR-, 1H NMR-, UV- spectroscopy, thermogravimetric analysis (TGA), differential scanning calorimetry (DSC), turbidimetry. AZHKEYEVA, Aiganym et al. Synthesis of novel thermosensitive copolymers based on ethylacrylate. International Journal of Biology and Chemistry, [S.l. ], v. 11, n. 1, p. 153-162, aug. 2018. ISSN 2409-370X. Available at: <http://ijbch.kaznu.kz/index.php/kaznu/article/view/302>. Date accessed: 24 apr. 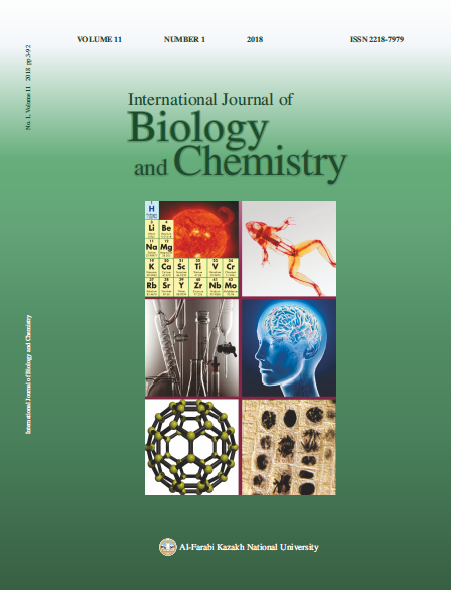 2019. doi: https://doi.org/10.26577/ijbch-2018-1-302.